Welcome to The Mark Sub-Penthouse! Perched on the 46th floor, this luxury residence is defined by sweeping 320 degree views of English Bay, False Creek, the North Shore Mountains, Mt. Baker, Stanley Park, Vancouver Island and so much more. Set to the spectacular background of Vancouver's world class scenery, this home resides in one of city's most exclusive buildings and coveted neighbourhoods. Rarely does a home of this magnitude come available. The thoughtful interior floor plan provides over 3000 square feet of living space, generous room sizes, ample storage and custom millwork throughout. The entire home is set up with the La Scala Home Automation System, which is a system that controls the lights, blinds, music, TV's, air conditioning and heating, fireplace and more. The system has 2 remote controls in each room, 2 iPads and a cellphone app to use the system. With a touch of a button, you can shut down all systems at night when you're ready to sleep, including black out blinds and all lights or you can set "scenes" for different entertaining scenarios. Contemporary roller blinds are on all exterior windows. There are 3 independent TV cable set ups so that you can be watching different shows from each TV all at the same time. The chef's kitchen is equipped with top of the line appliances including a Miele fridge, wall + steam ovens, dishwasher, microwave and coffee maker, gas cooktop and range, 112 bottle wine fridge and a 14 ft granite island with seating for 5. Other prized features include an appliance garage and pantry with a side by side SubZero fridge and freezer. This kitchen is sure to inspire creativity and perfectly designed for entertaining. The dining room features exquisite views to be enjoyed under a one of a kind glass blown Bocci chandelier. The chandelier features 19 coloured spheres which are controlled by the La Scala System and can be dimmed to fit the ambience. Across from the dining table is a 144 bottle, temperature controlled wine wall. Just off the kitchen is the bar and lounge featuring a swivelling 50" Samsung television that can be enjoyed from the kitchen sink, the bar stools or lounge area. The lounge has it's own bar with a sink, built-in ice maker and a Fisher&Paykel dish drawer dishwasher. Custom cabinetry surrounds to house your finest glassware. As well, a Town and Country fireplace with built-in marble surround and wood panelling can be enjoyed from this area. The fireplace lights and controls are activated through the La Scala System. The home is comprised of three bedrooms all with their own private ensuites and closets. Each bedroom is fitted with custom black out drapery that and custom blackout drapery that is activated using the La Scala System. The Master Bedroom is a dream with incredible floor to ceiling windows and luxurious bathroom. The master features a second custom home office space with jaw dropping views. Fit for a king, the bed has an automated TV that comes out from under the bed and sits perfectly at pillow height. The TV has the ability to swivel for viewing from the BainUltra free standing bathtub. The master bath provides a spa-like retreat with floor to ceiling stone walls, NuHeat in-floor heating and a 9 foot long shower. The shower features dual temperature controlled shower heads with a ceiling rain shower and separate hand sprayers. The walk in closet showcases exquisite craftsmanship with a custom closet system for maximum organization. The Mark is one of Vancouver's most iconic buildings, known for it's luxury amenities and prime location. 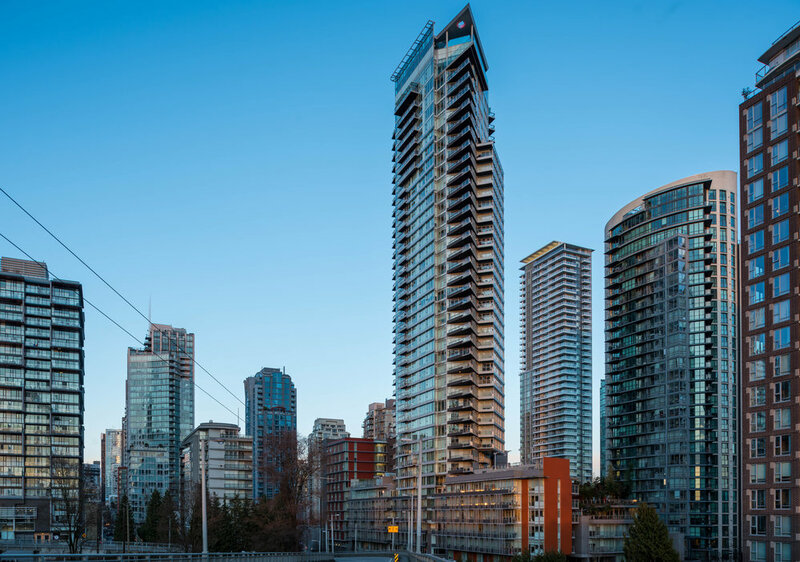 Built in 2013 by the renowned development group, Onni, The Mark has become a highly sought after building in Vancouver. The architecture was done by the award winning Hotson Bakker Boniface Haden. Reaching 47 storeys with 390 suites, this concrete building is a masterpiece and meticulously managed. From the 24 hour concierge, a rooftop garden terrace with a pool and hot tub, state of the art fitness facility, plots for urban agriculture and guest suites, The Mark has it all. For over half a century, Onni has been building communities for people to live, work, and play. Onni's success reflects their commitment to their employees and partners, and dedication to quality construction, innovation, sustainability, and customer satisfaction. Their expertise expands across North American cities such as Los Angeles, Seattle, Chicago, Phoenix, Toronto, and Vancouver.